← ARTISTIC DIGITIZER PART 8: Time Management aka saving time! If you’ve been struggling to sew in a neat, straight line, particularly at a higher speed, Janome has several presser feet available to help you out. One foot I particularly enjoy using is Janome’s Edge Guide foot, (foot SE) which is readily available from your local Janome dealer. Janome has many specialty presser feet available to help you achieve faster, more professional results with whatever sewing task you have at hand. Check out the Janome.com website or visit your Janome dealer to see which feet are available for your machine. I especially enjoy using the Janome Edge Guide foot because it has a very useful, fully and easily adjustable guide at the right of the foot. This is very useful on those machines which do not allow you to reposition the needle in specific increments. Instead of moving the needle, you can move the guide. There are little notches on the metal foot itself to help you. 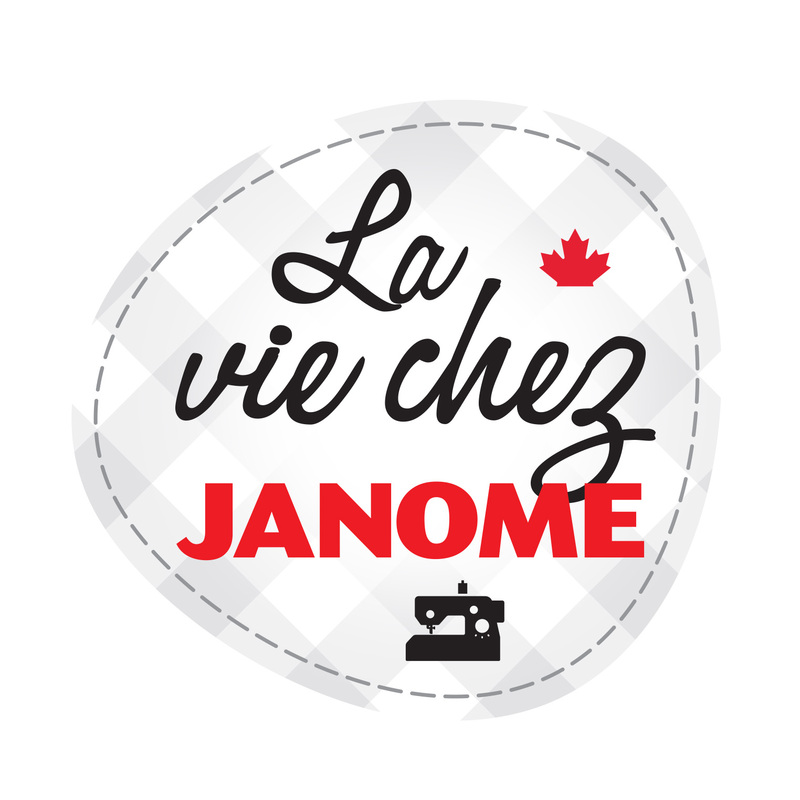 Janome thinks of everything! The Edge Guide foot presser foot I’m using is for 9mm machine models, which fits my Janome Horizon MC 15000 Quiltmaker. You can see on the Blister Pack that in this case it says 9mm, and there is a red stripe on the top of the cardboard backer. It’s important to get the correct size foot for your machine as this foot is also available for the 7mm and 5mm machines, so please consult your local Janome dealer for more information. Janome has included detailed instructions on the back of the Blister Packs for ALL their presser feet and attachments. You’ll find even more information about this foot, and many other Janome presser feet in the aptly named Janome Presser Foot Workbook, which is available through your Janome dealer. With the needle in the centre needle position and by the adjusting the guide all the way to the right you can achieve a quarter-of-an-inch seam, which is perfect for piecing quilt blocks, or for top stitching. 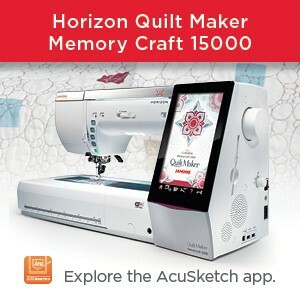 There are 91 needle positions on the 9mm Janome sewing machines, like the Horizon MC 9400QCP, the MC6700P, the Skyline S9, for example, so you can move the needle over to the right a notch or two to achieve that once-elusive scant quarter-of-an-inch, too. Like nearly all Janome presser feet, the Edge Guide foot easily snaps on and off from the standard presser foot holder which came with your machine. With the presser foot raised, press the little lever on the back of the foot holder to release the foot. Position a new foot under the groove, which is in the bottom of the foot holder and lower the presser foot lever (manually, or automatically depending on your machine) to snap it into place. EASY! Less time adjusting things means more time spent sewing – that’s the Janome way! 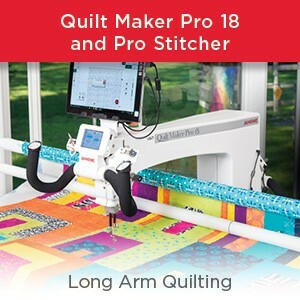 This foot was my first choice when I needed to top stitch a narrow folded border down to the quilt top before doing an all-over, edge-to-edge quilting design on the long-arm quilting machine, the fabulous Janome Quilt Maker Pro 18. I was able to position the guide super-close; less than one-eighth-of-an-inch away from the needle, in order to achieve nearly invisible results. I used a lightweight thread for this as well, so you’ll see, if you look closely, the results were terrific. You have to get up THAT close in order to see that top stitching. I was happy with the results, as was the recipient of this quilt. Sure, maybe I could have used a blind hem stitch and corresponding Janome Blind Hem foot, or one of the many applique stitches with the Janome Applique foot, but I wanted to use the Janome Edge Guide Foot for perfectly even, straight top stitching. It was the perfect choice! 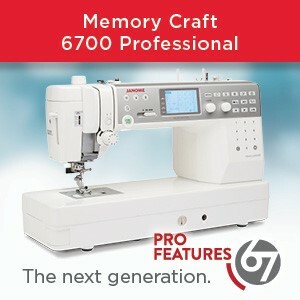 Fortunately with Janome, there’s always SEW many choices! The choice is YOURS! This entry was posted in Janome Foot of the month series and tagged EDGE STITCHING, JANOME, Janome Applique foot AP, Janome Applique stitches, Janome Blind Hem foot, JANOME BLIND HEM STITCH, Janome Edge Guide foot, JANOME EDGE STITCHING FOOT, Janome Presser Foot Workbook, Janome QMP 18, Janome Quiltmaker Pro 18 longarm quilter, Janome sewing machines. Bookmark the permalink.